Foxboro, 1 @ Mansfield, 1 – Final – Click here for a recap of the game. Attleboro, 0 vs. North Quincy, 0 – Final – Madison Brown made several key saves and Jordyn Forte and Rebekah Entwistle played well defensively to preserve the draw, according to Attleboro coach Steve Santos. Mansfield, 3 @ Foxboro, 2 – Final – Kristen Bortolotti and Lily Sykes each scored in the first half to give Foxboro a 2-0 lead. But, Stephanie Kemp scored twice to tie the game for Mansfield in the second half and with six minutes remaining Hannah Reiter scored off a corner to give the Hornets the win. Milford, 2 vs. Hopedale, 1 – Final – Freshman Juliana France off an assist from junior Leeanne Kibbee and Kristen Franzini from an assist by freshman Ashleigh Starks scored the Milford goals. Hawks coach Jay Mastaj said Nicole Dahlgren stood out defensively. Sharon, 0 @ Taunton, 7 – Final – Annie Tate netted a hat trick, Kya Enos and Liana Duarte each scored twice and Lauren Torres scored once for Taunton. Duarte also had two assists while Jillian Pagliuca, Diana Brens and Hannah Blackwell each had one helper. Taunton head coach Liz Hathaway said Katie Van Zandt, Bre Conlon, Jocelyn Pagliuca and Kylie Blackwell all played well defensively for the Tigers. Sharon junior goalie Lindsay Modes had a strong performance in net with double-digit saves. 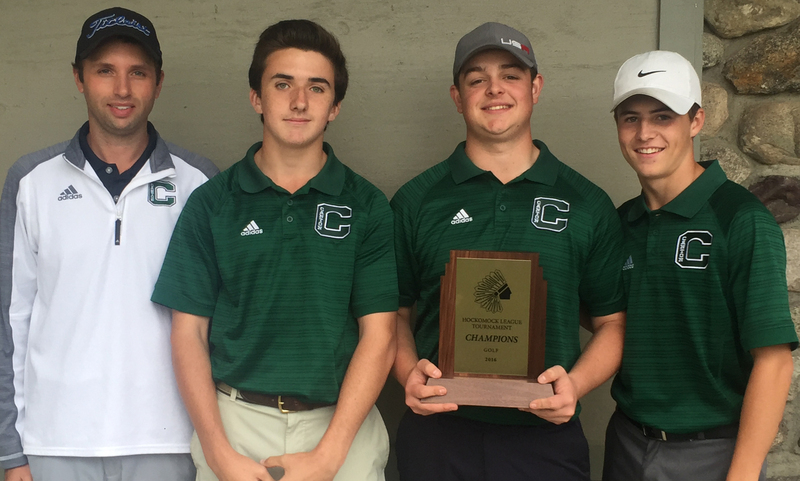 Foxboro, 176 @ Canton, 160 – Final – Canton senior Jackson Maffeo was the match medalist, shooting a 38 while junior Jack Goyetch carded a 39. Pat Duggan added a 41 for the Bulldogs. Foxboro’s Matt Tierney shot a team-best 39 and Colby Nickerson carded a 41 for the Warriors. Sharon, 174 @ Milford, 164 – Final – Milford’s Ryan Tomaso and Anthony Arcudi tied for the team-best, each shooting a 40 on the day. Stoughton, 182 vs. Hopedale, 173 – Final – Stoughton seniors Cam Doherty and Josh Roos led the Black Knights, each carding a 44. Attleboro, 2 @ King Philip, 1 – Final (8 inn.) – Nate Tellier scored both of Attleboro’s runs and tossed seven innings, allowing just one run to help the Bombardiers get a win in extra innings. King Philip took the lead in the fifth inning, with Jake Cavanagh getting hit by a pitch and then scoring on a single from Stephan MacMeans. Tellier reached on a walk in the sixth, stole second, moved to third on grounder and then scored when Will Carter made contact and the throw to home was off the mark. In the eighth inning, Tellier connected for a one out triple – his third triple in as many games – and scored on an RBI single from Pat Collins up the middle. On the mound, Tellier had 13 strikeouts, scattering five hits in seven innings of work. Matt Callahan pitched a perfect 1-2-3 inning in the bottom half of the eighth to clinch the win. Jack DiCenso allowed just one hit in 5.1 innings of work, striking out seven. Canton, 6 @ Milford, 7 – Final – With two outs in the bottom of the seventh, Anthony Arcudi connected for his second hit of the game, this one with the bases loaded to score Blake Hill for the game winning run. Hill hit a two-out double and Nick Johnson (HBP) and Marc Fornaciari (walk) loaded the bases. The Scarlet Hawks had 13 hits as a team with Hill (double, triple) and Arcudi leading the way. Chris Speroni, Alex Coady and Zach Tamagni each added a pair of hits for the Scarlet Hawks. Hill got the win on the mound after coming in relief and pitching a 1-2-3 inning in the seventh. Stoughton, 13 @ Foxboro, 4 – Final – Jake Gibb reached base five times with three hits, including a double and a home run, walked twice and drove in a team best four runs to pace Stoughton’s offense. Doug Seaman went 2-4 with a pair of doubles, a stolen base, four runs scored and 2 RBI while Pat Hagerty reached four times and scored three times from in the lead-off spot. Nico Parmeggiani got the win on the mound, going four innings, allowing three runs (two earned), scattering six hits with three strikeouts and just two walks. Barry Cooke pitched well in relief, allowing just one run over three innings, striking out three. Franklin, 0 @ Taunton, 7 – Final – Luke Figueira put in another strong performance for the Tigers on both the mound and at the plate. Figueira tossed six shutout innings, striking out seven while allowing just two hits. At the plate, the senior had three hits and an RBI. Brendon Mazerolle, Christian Simoes and Charles Hearrold III each had a pair of hits and an RBI for the Tigers. Mansfield, 3 @ North Attleboro, 4 – Final – The Rocketeers continued the trend of scoring late inning runs, this time getting a walk off win over the Hornets. With the game tied, Brian Poillucci picked up his fourth hit of the game singling in pinch runner Bryan Harris for the winning run. Poillucci gave the Rocketeers the lead in the first, connecting for a two-run home run, scoring Kyle McCarthy. Mansfield tied the game in the fourth inning with two run shot from Mike Arnold, plating freshman Dan Saraceno (single). Aidan Cahill gave the Hornets their first lead in the sixth inning, scoring pinch runner Conor Driscoll but the Rocketeers tied the game in the bottom half when Ridge Olsen scored Brian Poillucci (triple) with a sacrifice fly. Poillucci finished 4-4 with three runs scored. Matt Papineau got the win for the Rocketeers, tossing a complete game with three strikeouts. Jared Menzer threw a complete game for the Hornets, striking out four. Oliver Ames, 13 @ Sharon, 0 – Final – Ryan Adams had a huge day at the plate for the Tigers, driving in five runs on three hits. Josh Minuskin, Chris Romero, Chris Pearsons and Adam Burr all registered a pair of hits for Oliver Ames. King Philip, 18 @ Attleboro, 2 – Final (6 inn.) – The Warriors pounded out 21 hits, led by Sydney Phillips’ three run home run and four total hits. Brooke Taute and Kali Magane each had three hits while Christa Wagner (home run), Meghan Gorman, Elise Pereira and Jessica Bonner all had two hits for the Warriors. Pereira got the win, allowing just one hit in four innings of work. Magane finished the game with four strikeouts in two innings of work. Milford, 12 @ Canton, 1 – Final – Emily Piergustavo was perfect at the plate, going 5-5 with a double, a triple and knocked in a pair of runs. Maggie Farrell was also perfect, going 4-4 with a double and driving in a team-high four RBI and Jill Powers went 2-4 with three RBI and a home run. Kelley Reichert got the win, scattering three hits without giving up a run while striking out four. Foxboro, 7 @ Stoughton, 6 – Final – Stoughton was led offensively by freshman Jordan Lyons, who went 2-3 with a pair of runs scored and improved her season average to .500. Jenni D’Andrea also added a pair of hits for the Black Knights. Franklin, 0 @ Taunton, 5 – Final – The Tigers were limited to their lowest offensive output of the season but Aimee Kistner was strong in the circle, striking out five while allowing no runs or walks and just four hits in a complete game effort. Kistner was backed by strong defense, including a nice backhanded play by Jaime Brown down the third base line that resulted in a double play and backhand catch from Bailey Clapp in left with two runnings on. Kistner went 2-2 at the play with a triple and two RBI, Brown was 2-3 with a double, triple and run scored, Liana Duarte went 2-4 and Sarah Bagge was 2-3 with a run. North Attleboro, 3 @ Mansfield, 5 – Final – Freshman Madyson Bendanillo went 3-4 for the Hornets with a pair of RBI and two runs scored. Rachel Carafa also went 2-3 with a pair of RBI for Mansfield, while Maddie Letendre struck out 11 and allowed two earned runs in a complete game win. North Attleboro was led by Jordan Sharpe, who was 2-4 with two RBI, and also got two hits each from Meg Barlow and Gina Miceli. North had seven batters record at least one hit, but left 13 runners on base, including the tying run at first in the seventh. Sharon, 6 @ Oliver Ames, 11 – Final – Oliver Ames’ offense produced 12 hits to score double-digit runs for the second time this season. Lexie Campbell was 2-3 with an RBI and a run scored, Victoria Ziner was 2-2 with four runs scored and an RBI, Jamie Gottwald was 2-2 with a double, two runs scored and two RBI, Katie Pursley was 2-4 with four RBI and Dalene Gomes was 2-4 with an RBI. OA’s Jordyn Leite and Katie Mills both had a hit for the Tigers as well. Oliver Ames, 12 @ Attleboro, 6 – Final – OA senior attack Matt Gilson had three goals, sophomore attack Eric LeBlanc had three goals and three assists and sophomore Owen Gallagher had a pair of goals and one assist for the Tigers. Head coach Chris DiGiacomo said junior Sean Cosgrove was solid in net in his first varsity start. Franklin, 19 @ Taunton, 0 – Final – Senior Trevor Drake scored a pair of goals and had an assist while sophomore Luke Downie scored once and had two assists and sophomore Jonathan O’Glishen scored twice. Attleboro, 13 @ Oliver Ames, 9 – Final – After a high scoring first half that saw the Bombardiers take a 9-7 lead in the halftime break, Attleboro was able to limit the Tigers to just two second half goals. Hannah Lamothe led Attleboro with four goals while Sam Spaziano scored twice and had two assists. Kayla Merritt added two goals and an assist while Kyra Lions scored once and had an assist. Mish Logie added two goals for the Bombardiers while Emily Patton and Meg Dotzenrod each scored once. Taunton, 2 @ Franklin, 20 – Final – Franklin raced out to a big lead by halftime and never looked back. Kenzi Pleshaw scored three goals, including her 100th career goal to pace the Panthers. Senior Dani Lonati scored her first career goal for the Panthers. Attleboro, 0 @ King Philip, 5 – Final – Garrett Schneider battled to a 6-3, 3-6, 6-0 win at first singles to lead the Warriors to a sweep. Justin Rohan won 6-2, 6-4 at second singles and Marco DiStefano won 6-0, 6-2 at third singles. Sam Colella and Jake Webster paired up for a 6-3, 6-3 win at first doubles and Aidan Ignatius and Tim Costanzo stepped in to pick up a 6-1, 6-1 win at second doubles. Stoughton, 0 @ Foxboro, 5 – Final – Foxboro’s Liam Riess won 6-1, 6-3 at first singles, Andre Jaberi won 6-0, 6-0 at second singles and Matt Tierney picked up 6-0, 6-1 win at third singles. Shawn McNamara and Brandon Wasserman won 6-2, 6-1 at first doubles for the Warriors and Taha Baig and Paul Darcy won 6-0, 6-1 at second doubles. Franklin, 5 @ Taunton, 0 – Final – Franklin junior Rahul Herur won 6-1, 6-3 at first singles, junior Eli Brooks won 6-0, 6-2 at second singles and freshman Dan Barrow won 6-0, 6-2 at third singles. Junior James Johnston and senior Tom Mancini won 6-1, 6-0 at first doubles while seniles Cam Piana and Jeremy Gan won 6-1, 6-1 at second doubles. 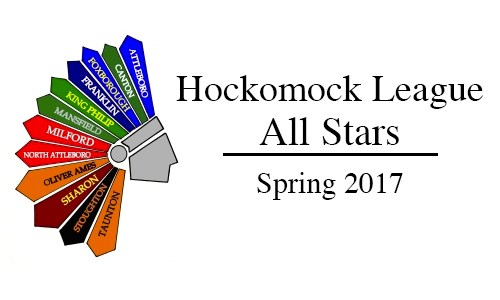 Mansfield, 1 @ North Attleboro, 4 – Final – The Rocketeers picked up wins at first and third singles and both doubles to get the win. Mitchell Dyer won 6-3, 6-4 at first singles and junior Zack Pfeffer won 6-2, 7-5 at third singles for Big Red. North Attleboro also got wins from seniors Jeff Yao and Nick Lockavitch at first doubles (6-3, 6-0) and senior Jake Fontes and junior Daniel Zhang at second doubles (6-2, 6-3). Mansfield’s win came from freshman Luke Nickerson at second singles (7-5, 6-3). Milford, 0 @ Canton, 5 – Final – Canton’s Carly Scanlon and Skyler Jabbour won in straight sets to pace the Bulldogs to a win. Scanlon won 6-3, 6-0 at first singles and Jabbour won 6-3, 6-1 at second singles. Jude Aboukhater won 6-2, 3-6, 6-0 at third singles, Tiffany Ha and Sarah MacQuarrie won 6-7, 6-2, 6-2 at first doubles and Talya Mayman and Julia Buskowsky won 7-5, 6-3 at second doubles for Canton. Taunton, 3 @ Franklin, 2 – Final – The Panthers got wins at first and second singles but the Tigers were able to win at third singles and in both doubles to get the win. Delaney DeAvila won 6-3, 6-0 (injury) at third singles, Ashleigh Eason and Emily Moor won 7-5, 6-3 at first doubles and Jillian Pagliuca and Caroline Hebert won 6-2, 6-4 at second doubles. Franklin’s Hannah Sweeney won 6-0, 6-0 at first singles and Anna Humphreys won 6-0, 6-0 at second singles for the Panthers. Foxboro, 0 @ Attleboro, 1 – Final – Sophomore Grace Mayer scored in the second half to give Attleboro the win. Oliver Ames, 0 @ Franklin, 2 – Final – Freshman Annie Walsh scored her first career goal on an assist from senior Diana Griffin and sophomore Christina Quinn also scored on assists from Walsh and junior Alex Sullivan. Franklin’s defense only allowed one shot on goal and head coach Lisa Cropper said senior Taylor Reutlinger and junior Dana Lewandowski played well in midfield. Milford, 173 @ Foxboro, 170 – Final – Matt Tierney, Tim Luciano and Blake Wasserman all shot a team-low 42 for Foxboro. Attleboro, 182 @ Mansfield, 165 – Final – Mansfield junior Jason Hindman was the match medalist for the second straight time, shooting a 39. Seniors Devon Barbero and David Craig each carded a 41 for the Hornets. Keagin Larkin shot a team-low 42 for the Bombardiers. Stoughton, 198 @ King Philip, 163 – Final – Mickey Riley, a senior for King Philip, shot a team-low 38 for the Warriors in the win. Canton, 170 @ Sharon, 169 – Final – Sharon senior Cam Sydney had a match low 38 for the Eagles. Canton’s Griffin Jerrier shot a low score of 41 for the Bulldogs.